Amber is a fossil resin derived from forest trees nowadays extinct; its colour, its natural transparency and its curious electrostatic properties have always attracted man who used it to make jewels and art objects for centuries. 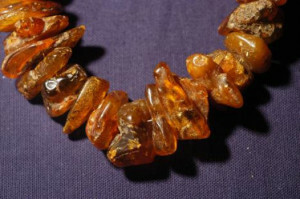 Carry out the recognition of copal (partially fossilized resin), often given as amber (completely fossilized resin). Carry out the attribution to a large number of natural varieties of known ambers both European and extra-European.